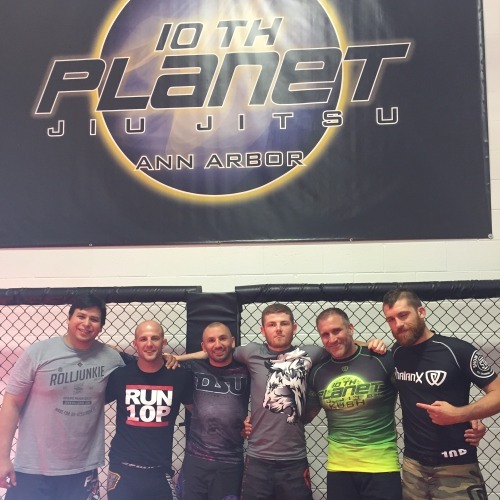 I was on the road again and busy last weekend with a trip to Ann Arbor, MI for The Great Lakes Training Camp Leglockapalooza held at 10th Planet Ann Arbor. Rather than a few hours to New Jersey, this road trip took me almost 12 hours all the way across NY, through Ontario Canada, past Detroit, and into Ann Arbor. It was a ton of tiring miles on the road but well worth the experience and knowledge gained. 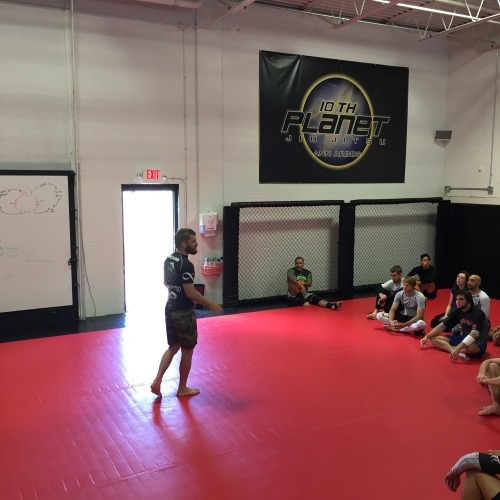 Saturday kicked off with a seminar by Chris Herzog from 10th Planet Rochester. I was 20 minutes late getting in due to a hold up at the border getting back into the U.S., but luckily everybody was running on 10th Planet time and I only missed a few minutes. 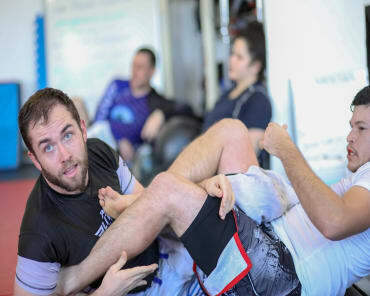 Chris taught some basics of his reaping leg lock system but focused primarily on the escapes and counters. He also spent some time talking about the importance of staying aware and escaping when there is an opening. I will keep this in mind before my ankle gets popped next time! After a short break Sean Applegate from 10th Planet Gulf Shores was up next. Sean’s instruction focused on methods to get to the 411/honey hole/saddle/inside senkaku with both legs controlled. (We are going to stick with 411 for now since that is the term that Sean uses.) It was easy to see the value in controlling both legs as you enter the 411 as we transitioned into finishing mechanics while still controlling both legs. Sunday started with Scott Yockel also out of 10th Planet Rochester, who was just recently promoted to black belt by Chris Herzog. Scott started off with the ham sandwich from open guard and moved onto using the ham sandwich to counter de la riva hooks. I have been using the ham sandwich for a long time and had recently started playing with it from standing to counter the de la riva hooks so it was great to pick up some details from Scott. After the ham sandwich series we moved onto some Russian Cowboy basics. To close out the seminars on Sunday afternoon we had Nathan Orchard out of 10th Planet Portland. Nathan started with some standing entries into leg entanglements and then focused on using those control positions to transition on top. I picked up some great transitions and flow drills from Nathan that I will definitely be implementing. Nathan also taught a counter heel hook to when your opponent changes the knee angle to escape the 411, as well as a counter to that counter. Boom! Although there were four leg lock seminars from four instructors with different styles, it was not just a mess of random leg locks. Each instructor was working around a specific concept and it was easy to see how they could all connect with the next. The 11.5 hour drive straight home was miserable and I am still exhausted but I cannot put a value on the knowledge and relationships I gained in Ann Arbor.